NOTE: This is an updated version of an old recipe on the blog. Scroll to the bottom of this post for the new recipe! Some recipes just need a little refreshing, a little updating, a little reintroduction. This one pot creamy Parmesan garlic gnocchi is one of them, and I hope you agree — it’s good to see it here again. The original recipe for this creamy, carb-happy dish was made with a prepackaged sauce which, as far as I can tell, has been discontinued. But I didn’t want that to mean that our relationship with the one pot gnocchi should also come to an end, oh no no nooooo. That would just be cruel. Instead, what we now have here is a recipe that is just as fast (15 MINUTES, YOU GUYS), just as easy (10 ingredients! ), and just as delicious but with a homemade sauce instead of one that pours out of a pouch. In other words, this newly revamped one pot creamy Parmesan garlic gnocchi dish = BAE. As with all one pot recipes, I love that this entire dish cooks together. 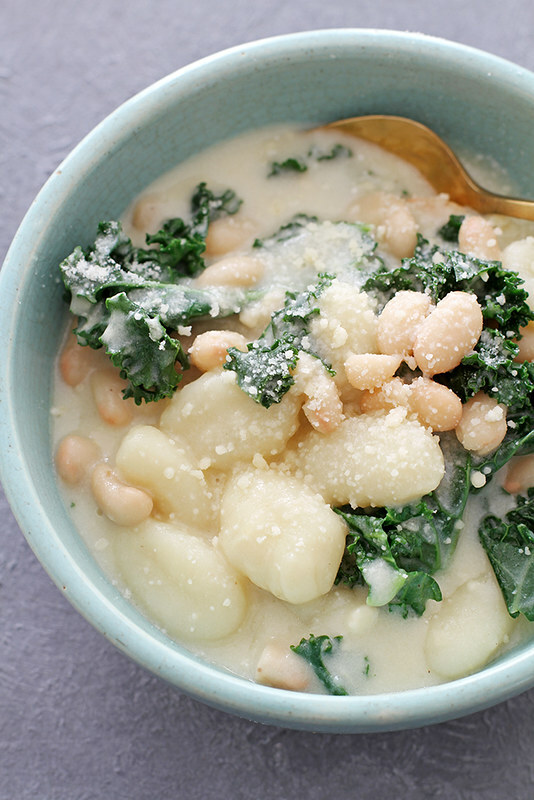 You make the quick sauce, add the gnocchi, let the gnocchi cook directly in the sauce, then stir in some goodies like Northern white beans, fresh chopped kale and grated Parmesan cheese. And that’s all she wrote. So when you’ve got a couple hours of The Bachelor to watch but only a few minutes to get dinner ready beforehand, this recipe is your BFF. And even though it’s creamy, the sauce is made with just a little bit of butter and milk, so it’s better for you than just straight dumping cream into the pot, as some creamy pasta recipes require. I mean, don’t get me wrong, those recipes are DELISH, but sometimes it’s just too much. Plus, this makes me feel like I can sprinkle extra Parmesan cheese on top of my gnocchi with a heavy hand. Balance. If you’ve tried the original version of this recipe on my blog, I’d love to know what you think of the new recipe with the homemade sauce! And if you haven’t yet tried it, now is the time to get this dish into your life. It’ll warm you up from the inside out, like good comfort food should, and carry you through the rest of this ridiculously chilly winter. One pot creamy gnocchi, will you accept this rose? Heat olive oil in large saucepan over medium heat. Add garlic; stir constantly for 1 minute until fragrant. 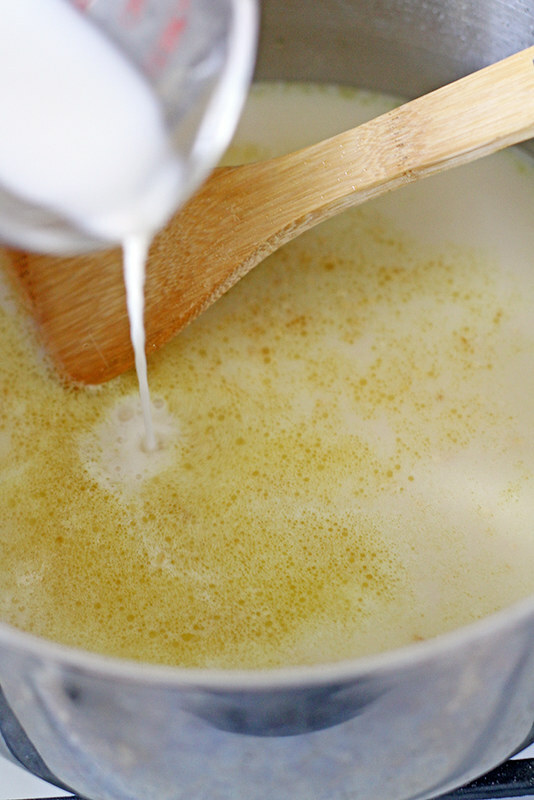 Add chicken broth, milk, butter and a few dashes of salt and pepper. Add gnocchi; stir to combine. Cook, stirring often, 3 to 5 minutes until gnocchi is soft and cooked through. 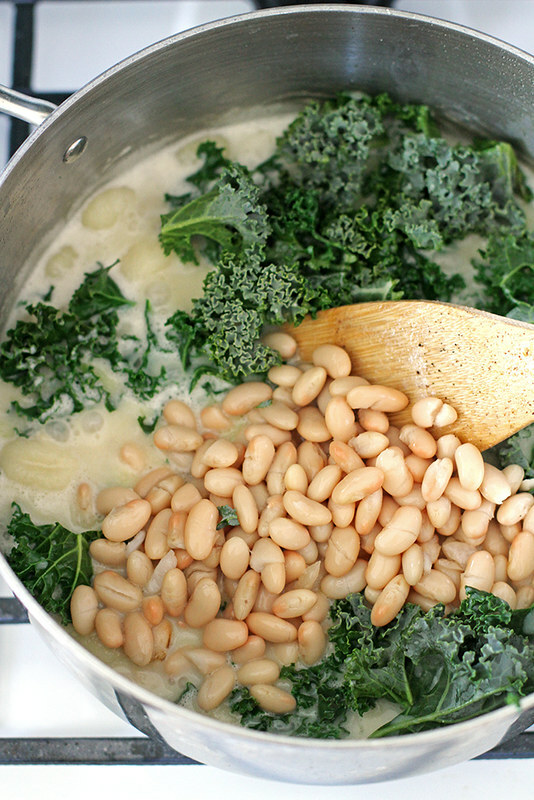 Stir in kale, beans and Parmesan cheese. Cook until kale is just wilted. Serve with more grated Parmesan cheese sprinkled on top. The beans in there are such a great addition! Love this simple meal! Katrina — They make this dish just that much tastier and more filling. Thanks, girl! 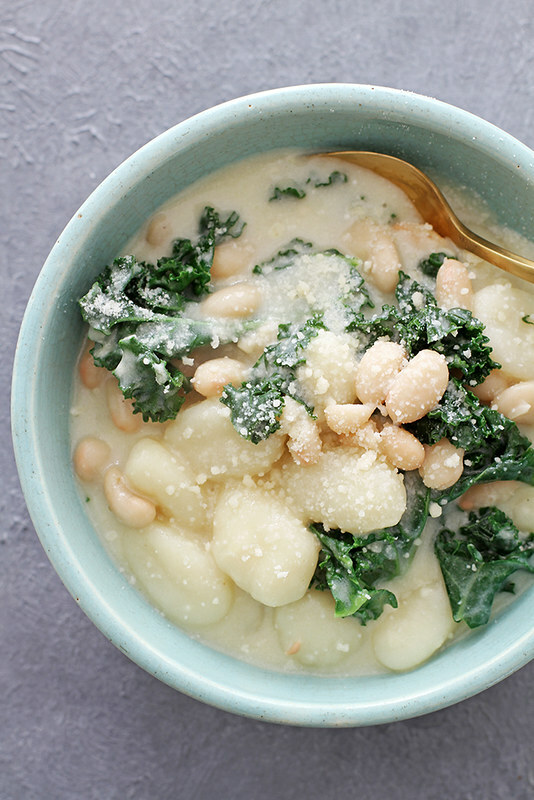 Gnocchi and beans and kale are three of my happy foods, and I bet that all three of these together would be fantastic. This looks great for this time of year, when all I want to do is hunker down and wait for the spring to come. Ummm, pinned. This looks amazing, and one pot? Love it. Um, yes please! 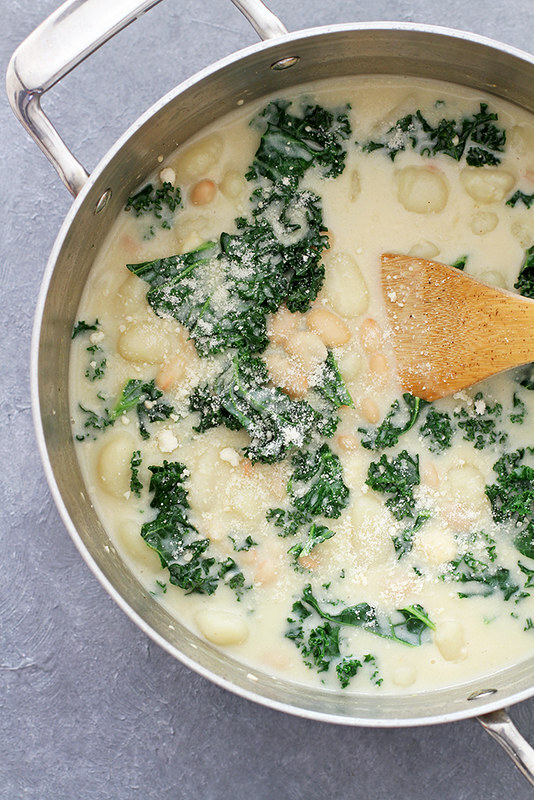 You had me at one pot and creamy gnocchi… is anything better than that?! You had me at 15 minutes! Also, I am on the gnocchi bandwagon right now so bring it on! What perfect cold weather comfort food! Love how quickly this all comes together! This soup is real goodness ? Love thisss – you saying bae is BAE! be still my heart! Creamy, flavorful gnocchi and parm garlic sauce made in ONE POT??! game changer! Oh I love this!! Mostly pantry staple recipes are my jam. Definitely pinning this for a quick weeknight dinner. Love how fast and easy this was yet so so delicious. My husband kept saying how good it was which is always a big plus bc he s always honest when it comes to food. I sautéed some mushrooms on the side and added them in for even more flavor. Yummm. Will be making this again. Thank u! This is one of my favorite, go-to meals. I make a few modifications. I do 2.5 cups 1% milk instead of any broth. I also add one pound of ground mild Italian sausage. This is a game changer! The flavor of the sausage mixed with the gnocci and kale is amazing. My husband loves it! It also gives you all the major food groups then.. Protein, fiber, power greens, and carbs! Thank you so much for the updated recipe! I have been dying for this but haven’t been able to find the sauce so haven’t been able to make it again! It’s what’s for dinner tonight! Tasty and a very quick meal that taste hearty. Making this ASAP and adding sausage.. like a kielbasa.. I’m swooning!